Whisk together egg, milk, salt and pepper in a shallow bowl, transfer breadcrumbs into a shallow bowl. Dip each chicken breast into egg mixture, then coat thoroughly with breadcrumbs. Heat olive oil on medium heat in a large skillet and fry chicken breasts for 5-7 minutes on each side, or until breading is golden brown and crisp. 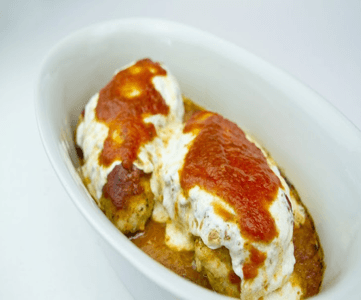 Transfer chicken breasts to a baking dish, cover each with tomato sauce and mozzarella and bake for 30 minutes. Remove baking dish from oven and preheat the broiler on high. Return dish to oven and broil for 3-5 minutes or until cheese is brown and bubbly. Serve immediately.